Franklin Mills multimedia cabinets offer all the built-in features you would expect from the leader in storage systems. Our full line of multimedia cabinets and storage systems are designed to meet the needs of any media collection for today and tomorrow. Our space-efficient cabinets offer drawers and shelves that can be easily reconfigured as media formats change. Each drawer includes full-width horizontal drawer pulls, infinitely adjustable dividers, and drawer interlocks for safety. An optional security lock can be added for sensitive material. 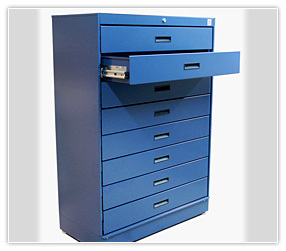 Our cabinets are designed for quick installation and easy relocation.